A student was experiencing many obstacles when trying to practice Dharma and asked how to purify the obstacles. Rinpoche advised that death can happen any time, so we need to find time for daily purification practices. 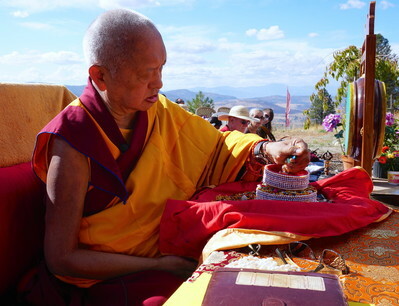 Rinpoche also recommended mandala offerings with the Special Request for the Three Great Purposes prayer in order to cease wrong concepts, generate correct realizations and pacify outer and inner obstacles. Thank you for your email. I checked and you should do prostrations by reciting the Thirty-five Confession Buddhas’ names. That is best for you. If you can, do 100,000 prostrations. Try to do this, writing down every day the amount you have been able to do and keeping count that way. When you have time, do more. If you have children or are busy with your job, then the morning and evening times can be very busy, so what you can do is get up early in the morning and do prostrations—before the children get up, if you have children—or you can go to bed earlier. In essence, make your sleeping time shorter. If we don’t purify our negative karma, if purification doesn’t get done, death can happen any time and after death we can go to the lower realms. This can happen at any time—dying and then going to the hell realms, where we have to suffer for eons—so it is now that we can purify negative karma. Once born in the hell realms, there is nothing we can do, finished, it’s very difficult. Someone can pray for us—that may help—but when we do practice by ourselves now, that’s stronger. So if you have children or are very busy, you should go to bed earlier, and then in the morning you can get up early. Or you can make your sleeping time shorter. Anyway, we have slept from beginningless rebirths and it hasn’t helped us to be free from samsara yet. We can die any time and then we have to go to the lower realms and experience the heaviest suffering. Even the heaviest suffering of human beings is the lightest suffering in the hells. The heaviest suffering of human beings is like great peace and like the lightest suffering in the hells. The suffering in hell is the most unbearable, unbearable suffering, so it is like that. Also do 300,000 Vajrasattva mantras. You can do Vajrasattva practice every day, and during that practice you can do one mala or half a mala or 21 mantras. Also, before you go to bed apply the remedy of the four opponent powers. Yes, there are some people who have many obstacles when listening to teachings, and when they don’t meditate, then nothing happens. For some people it is like this, and it means there is an obstacle to practice. It is also very good to do mandala offerings. The mandala offering is very important and at the end of Jorchö preliminary practice, when you make the mandala offering, make a request for the three great purposes. Please bless me and all mother sentient beings to quickly cease every kind of mistaken mind from disrespect for the spiritual friend up to the subtle dual appearances of white appearance, red increase, and dark near-attainment. Please bless us to easily generate every kind of unmistaken mind from respect for the spiritual friend up to the union of no more learning. The first request is to pacify all the wrong concepts up to subtle dual view of the white, red and dark visions, next is to generate all the correct realizations from guru devotion up to enlightenment, and the third request is to pacify the outer and inner obstacles. Also give your body as a wish-granting jewel, as numberless, so make charity to all those six-realm sentient beings. Then give your possessions and all your past, present and future merits to numberless sentient beings, so they receive all the happiness. They receive the happiness of this life and of future lives, and ultimate happiness, liberation from samsara, peerless happiness, enlightenment, so they receive everything. Then rejoice. When you give your body, possessions and merits as a wish-granting jewel, then everything becomes wish-fulfilling for all the sentient beings. The main thing is that they achieve all that happiness, liberation and enlightenment.